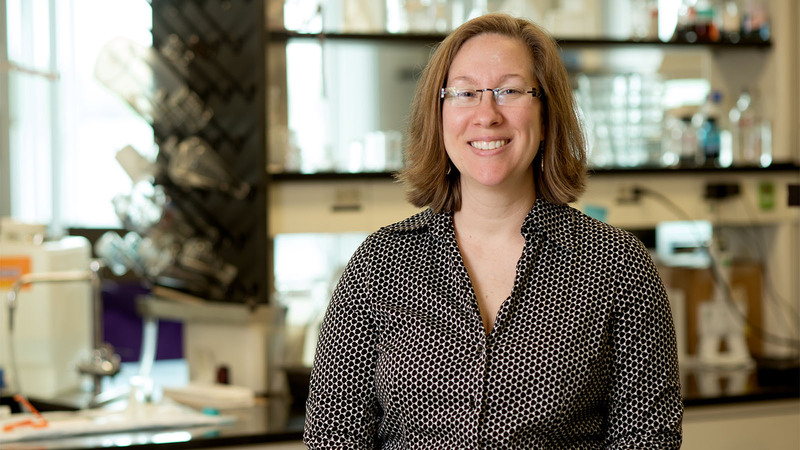 Nicole Levi-Polyachenko, PhD, develops electrically conductive polymer nanoparticles to target colorectal and breast cancer cells, as well as other novel polymer materials for treatment of cancer and infectious diseases. Her collaborative research focuses on developing heat-emitting polymers for therapeutic and device applications. Nicole Levi-Polyachenko, PhD, earned her doctoral degree in biomedical engineering at the Virginia Tech-Wake Forest School of Biomedical Engineering and Sciences, where she was first introduced to hyperthermia applications of carbon nanomaterials for cancer treatment. After completing postdoctoral training at Wake Forest School of Medicine, she joined the department of plastic and reconstructive surgery in 2009 to focus on materials development and assist with the design of medical devices, including a negative pressure sponge for wound therapy. Expertise in materials science and polymer synthesis is central to Levi-Polyachenko’s research. Her primary focus is on the use of nanoparticle-generated hyperthermia for medical applications. She discovered a unique formulation that allows polymers to disperse readily in water and to generate heat when exposed to infrared light. Using this approach, she develops non-toxic, electrically conductive polymer-based nanotubes and fluorescent nanomaterials to target and treat colorectal and breast cancer cells. She studies the effectiveness and implications of photothermal therapy in animal models and uses localized heat therapy to augment the treatment of bacterial and dermal infections. She is involved in the construction of heat-generating nanocomposite materials for medical devices that contain silicone elastomers and developed a bioresorbable elastomeric device for cleft palate closure. Developing heat-generating nanoparticles to detect and treat disease safely and effectively is Levi-Polyachenko’s goal. She has wide capability to develop polymers and advance material prototypes through industry partnership, with specific expertise in the medical application of novel polymer materials for treatment of cancer and infectious diseases. These water soluble polymers are easily introduced into the body and generate heat when targeted with a laser, allowing them to destroy cancer cells and unwanted tissues. Director of the Center for Nanotechnology and Molecular Materials, Carroll researches alternative energy solutions, focusing primarily on quantum matrix composites.